Key words: Composite, finite element analysis, stress concentration, tensile strength. stress concentration by using coaxial auxiliary holes were introduced nearby the main hole. fiber reinforced ply laminated composite. factor near the hole of the specimen. Hybrid composite laminate plate prepared using glass and carbon fiber with epoxy resin. elongation it measures displacement with respect to force act on it. the exact value of stress around the hole. acting on the specimen it leads to failure along the fiber direction. clearly visible the stress concentration of the specimen. x-axis. The maximum stress concentration near the circular cutout. 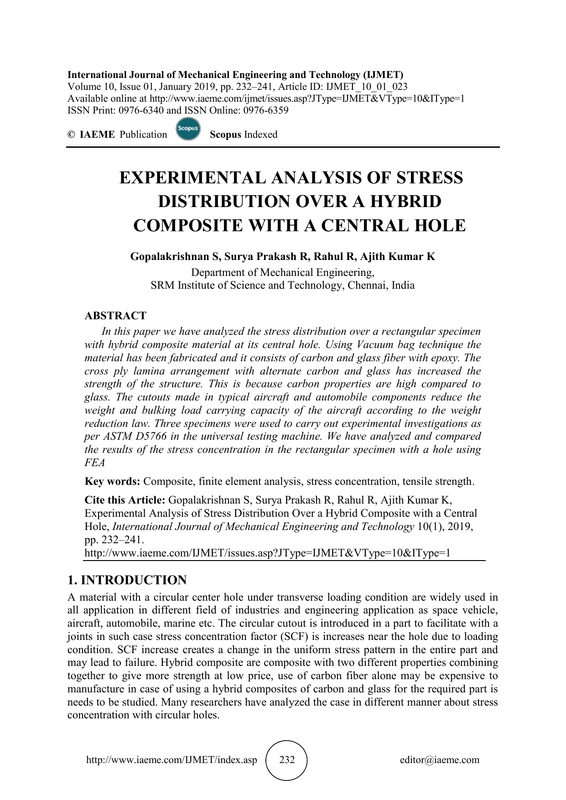 journal of mechanical and industrial engineering (IJMIE) ISSN No .2231-6477,vol-3,iss1,2013. of science & technology, vol.30, no. B4, Oct 2009. Mechanical Engineering Researches And Development (IJMERD), ISSN 2248-9347, Vol1, pp.01-1 may 2011. 7, issue 6 pp.37-40, Jul -Aug 2012.
International Journal of Emerging Technology and Advanced Engineering, ISSN 22502459, Volume 2, Issue 4, April 2012.